RAPAPORT... Rescue workers have lifted one miner from Alrosa’s Mir operation to safety following a flooding incident at the mine. Eight workers remain underground, the diamond company reported. Alisher Mirzayev was brought to the surface on Saturday and is in intensive care in the city of Mirny, Yakutia, the miner said in a Russian-language statement Sunday. He is conscious and communicating with doctors, Alrosa added, reporting his condition as “severe but stable” and not life-threatening. On Friday, water flowed uncontrollably from the quarry into the underground section of the mine due to a sharp deterioration in geological conditions and erosion of rocks in the quarry, Alrosa explained in a statement later that day. A total of 151 workers were in the mine at the time of the incident, with 142 initially brought to safety. Alrosa employees who descend to the mine to help with the rescue operation will receive double pay, company president Sergey Ivanov said. 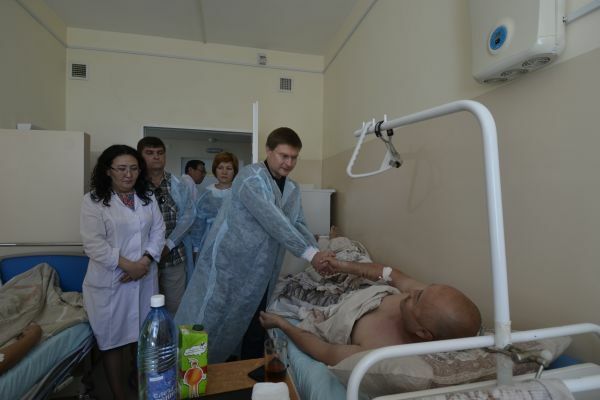 Ivanov visited workers in the hospital, which is in the same city as the mine. Image: Alrosa president Sergey Ivanov visits injured miners at the Mirny hospital.